1. A blog can have multiple feeds, and you may want to add up the subscribers for the most important feeds. 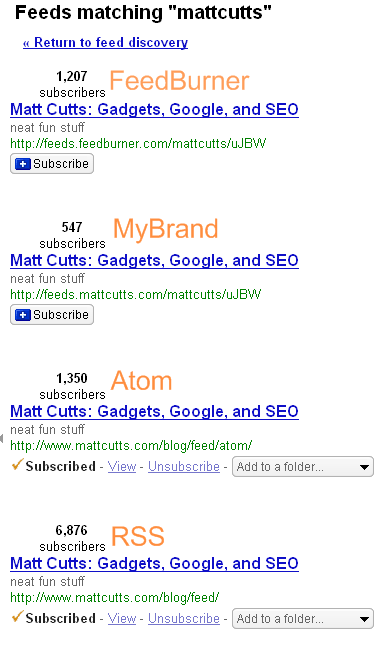 I got that data by going to Google Reader, clicking on “Add subscription” and then searching for the string “mattcutts”. If you have a unique string in your domain name, that’s a good way to see the top feeds for your site. I’ve used orange letters to highlight that I have a feed at FeedBurner, a MyBrand feed (served by FeedBurner, but with a CNAME from my domain so I control the feed with DNS), an Atom Feed, and an RSS feed. If you add all those up together, you get 9980 subscribers. So I’m 20 readers short of ten thousand Google Reader subscribers. 🙂 By the way, I think that MyBrand is one of the least-used but greatest features from FeedBurner (which was acquired by Google earlier this year). With MyBrand, your feed is served by FeedBurner, but you keep the control of the feed url in case you decide to leave FeedBurner some day. The best write-up on MyBrand that I’ve seen is this tutorial by Danny Sullivan. 2. You may have more users than your top few feeds suggest. 3. 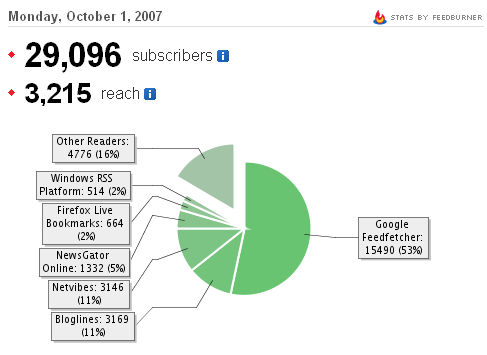 FeedBurner can aggregate all your different Google Reader subscribers into one number. Of course, FeedBurner will only give you stats for your own site. That’s why everyone is having a good time looking at the Google Reader subscriber counts. 🙂 Just remember that Google Reader subscriber stats will skew toward Google users. That’s probably why some Google-focused blogs do better in Google Reader’s stats when compared to some other metrics. Anyway, if you want to lift my Google Reader subscribers above 10,000, just add my RSS feed or my Atom feed. I’m in a multi-week blogging lull as I work on a non-webspam project at the Googleplex, but I’ll be blogging more in 3-4 weeks. Matt do you know if feed numbers relate to traffic in a consistent way? The RSS feed activity is independent of hits on your server, right? Joe Duck, I believe the RSS feed activity will show up in your web server logs a little bit; the data has to be fetched from the webserver, but I’ll bet that caching comes into play as well. My guess is that for each person’s blog, there’s a pretty consistent ratio between RSS and web traffic, but that it will vary for each blog. I don’t put a lot of work into making my blog pretty because I assume that people will mostly read me in a feedreader, for example. Someone with partial feeds might get more web traffic, etc. Nice timing Matt! I just finished submitting 2 xlm files to Google so they show in personal searches. It tracks the top feed readers (e.g., Google Reader, Netvibes), number of subscribers, most popular feeds, post views, clickthroughs, etc. > Just as an aside, how cool is it that on Firefox with the Google search box, if you start typing in math, the auto-suggest will give you the running answer as a suggestion — without even hitting return? As an aside to your aside, the IE Google Toolbar does the same thing. And yes, it is very handy! Joost, there’s a list of SEO blogs with Feedburner’s feedcount feature turned on over at OMB. Nice info, so this can be done with a wordpress blog as well I am guessing, actually that would make sense since this is a wordpress blog. I like how you were showing yourself doing addition in the google search window. I was doing similar when looking for words for my sons writing project yesterday. Good tip to avoid data misinterpretation. Neat trick… Of course I’m a bit depressed now that I see my reader count. Mihai, very cool! Thanks for stopping by with that pointer. O.K. This brings up two important questions. 1. Either Matt, or Joost, how do you get a real link in your comment? Is it just a straight html link? 2. I thought wordpress set up the feeds automatically. Is that correct or do you have to set them up seperately, at sites such as feedburner. Google reader seems to automatically grab the feeds, but when I went to feedburner to find out my stats, I had to log in, and it seemed like set up my feed? Who can explain this? By the way, when did 5+7=12 instead of 11? Michael, don’t feel bad. I have had as many as thousands of readers in a week, and I only have two subscribers at google reader. I am one of them. I wonder who the other one is! >> By the way, when did 5+7=12 instead of 11? Just noticed a bit problem in the way Google actually spiders sites and feeds. If Matt reads this, I was just wondering whether he could take a look at my site (the domain in my e-mail address). It appears that Google refuses to spider it or crawl the page because it things the site is abusive – basically with any page using Ajax tabs, changing the tab will work in firefox but in IE it requires you to insert a meta-redirect back to the original tab page – otherwise it will just show the actual html/php file of the tab. When google visits the site, it of course follows the links on the tab and ends up spidering the page and when it sees the meta redirect tags, it things its a form of abuse. I deliberately am not including my page because I don’t want to give any black hat seo ppl ideas. If you look at the url in my e-mail address, you’ll better understand what I’m talking about if you see it. Notice that with some rss feeds that are now employing ajax (as dumb as it sounds) within the articles/posts themselves – this could cause it not to be spidered. I guess many “people” prefer to visit the blog and smell the flavor of the posts while they are hot. And of course to meet very interesting commenter friends. I’m sure you recieve a billion strange and unsolicited messages, this is one. But of course I think mine is special. Anyways, my brain just keeps on telling me that it would be very obvious for google to create a mix of captchas and ads. I’m sure you smart people have probably even thought about it. But think how many captchas are going to waste on blogger that aren’t generating you any $$$. Anyways, I always like to at least post my ideas into the ether because, hey, it makes me feel better. Congratulations on those feed numbers Matt. Very well deserved. I am also a little concerned that a Dr. does not seem to have single digit addition down yet. Tom, as Google is the most advanced SE of any and has the largest database of pages etc, I would bet the “problem” is at your end, not Google’s. “I don’t put a lot of work into making my blog pretty because I assume that people will mostly read me in a feedreader…. The RSS feed activity is independent of hits on your server, right? I’ve done some writing about websites vs blogs as a platform for authors, and it seems to me that blog archives leave a lot to be desired when it comes to attracting deep links and organic search. You have a large subscription readership, could you give us an idea how your archived posts do for search traffic? Go away little boy, your constant spamming & contary words are showing you for the fool you are. Morris Rosenthal, I believe it is real PR that determines if a site is worth the bother of deep crawling or not. Maybe I have this all wrong, instead of fighting black hat perhaps I should seek to join them.You have already, you are just too stupid to know it. The question isn’t about PR, but about deep linking to blog posts and organic traffic. I’d assume that all blog archives have all of their entries crawled by Google unless they are scrapers or something. What I’ve observed with blogs is that the individual archived posts don’t seem to get as much organic traffic as they would if they had been standard HTML pages on a website with oldfashioned navigation. I know with my own blog, the earilest posts tend to get the most search traffic, and if I’d stopped blogging after the first 100 posts, I’d get maybe 75% as much organic search taffic as I do now years later with over 300 posts. Now there could be many reasons for this, including the inevitable repetition when you stick with one subject, which may lead Google to favor the senior posts. In turn, those posts continue to generate more deep links over time, reinforcing the outcome. But I think it’s also a simple issue of people who link to blogs favoring the main page, which means those archived posts don’t get as much link juice over time as they would had they been more-or-less stand alone HTML pages addressing individual topics. As far as I can tell, the overall PR of a site has very little effect on the search visibility of individual blog posts, it’s the direct, contextually relevent deep links to blog posts that make them valuable (in the eyes of Google). The reason I asked Matt about his experience is that he is way beyond me in both subscribers and deep links, but I’m curious if the effect holds up. No, but the solution is. Are you getting bored of blogging? I like feeddemon! have you ever tried it? “I wrote a protection system that cant be……..” Oh rly? Well done, and this has what to do with Google Reader subscriber numbers? I know a good therapist – she deals with alter egos.. Want her number? Hey all, I’m still alive — just steeped in the last stages of my project..
How could you get that many readers in your RSS ? Please kindly show us how. Thanks. I’d like to reply to Dave saying that the domain, the older, the better. The trust rank is one of the main ranking factors of Google and I think that the length of a good and old html page can help your rankings more than the shortness of any post. Any idea when FeedBurner stats will appear in the Google Webmaster Center? I noticed that they added a spot where we can see our Google subscribers, but since I use FeedBurner and that is not part of my domain, I don’t see any subscribers in the Center. Will we be able to tie in our FeedBurner account to our Webmaster Center stats? I don’t fully understand Feedburner, can anyone break it down for me Barney style? Hmmm, though knew the importance of feed, but the statistics shown a totally new picture!